We are pleased to offer for sale this Zimbabwe 100 Trillion Dollar Bill Bank Note 2008 Uncirculated Banknote - Hyperinflation Money. This Zimbabwe 100 Trillion Dollar Bill is in crisp uncirculated condition straight from an original bank brick. 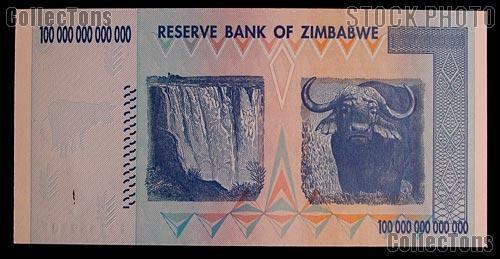 Each Zimbabwe 100 Trillion Dollar Bill comes in a currency sleeve for protection. 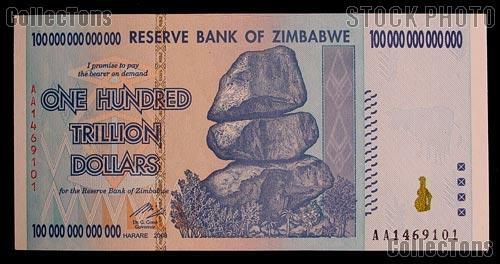 These Zimbabwe 100 Trillion Dollar Bills make a great gift and are a rare oddity. From 2004-2009 Zimbabwe suffered from hyperinflation. In November 2008 Zimbabwe suffered the second highest hyperinflation ever, second only to the hyperinflation that happened in Hungary in 1946. For a country to qualify for hyperinflation, the inflation rate must hit a minimum of 50% per month. Zimbabwe surpassed that mark in February 2007. During the height of inflation from 2008 to 2009 inflation was estimated at 6.5 quindecillion novemdecillion % (or 65 followed by 107 zeroes)! !